The Internet was excited this week over the impending return of the iconic 1980s soda brand New York Seltzer. Meanwhile, another classic beverage from the ‘80s and ‘90s has officially gone back into production, and the news has slipped under the radar. For the first time since 2009, Clearly Canadian hopes to be in customers’ hands by August. Back in January, venture capitalist Robert R. Kahn purchased the brand and developed a unique campaign to bring it back to market. The plan: Begin selling preorders of Clearly Canadian by the case. Once they reach 25,000 orders – boom – the clear, fruit-flavored soda would get bottled. On March 18th, Clearly Canadian announced they had reached their goal and were starting production. 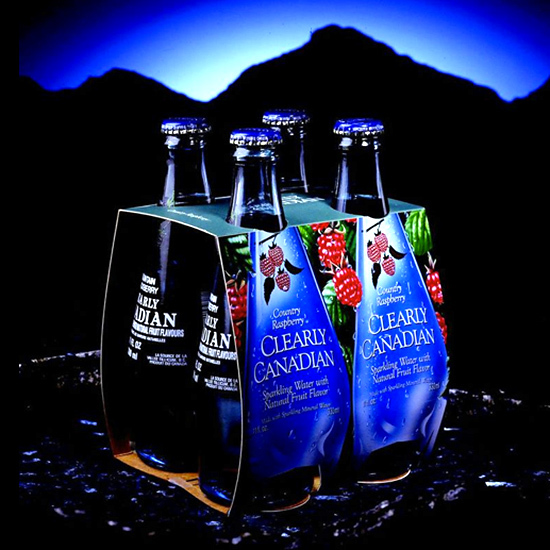 Under Kahn’s leadership, Clearly Canadian is returning to its classic 11-ounce bottle and is back to just four flavors: Mountain Blackberry, Wild Cherry, Orchard Peach and Country Raspberry. Whether or not the clear soda can once again get beyond direct sales and return to its ‘90s glory is still to be seen however. I don’t know exactly how much soda Clearly Canadian moved back then, but when I was sixth grade they sold at least 180 bottles of the stuff: My mom packed one in my lunch every single day. I think it was the coolest I ever was. Until now of course.